In December 2009, an underwater electric barrier thought to be the last line of defense between Asian carp and the Great Lakes was shut down for maintenance. With recent DNA evidence suggesting that carp may be nearby and no backup barrier yet in place, state and federal environmental agencies descended on the Chicago Sanitary and Ship Canal and coordinated one of the nation’s largest-ever applications of a commercial fish poison. The a multiagency task force led by the Illinois Department of Natural Resources injected 1,800 gallons of Rotenone into the canal that day to wipe out every fish in a 6-mile reach downstream of the barrier. But just important as killing any potential Asian carp was making sure that the poison didn’t drift beyond the downstream end of the treatment reach. 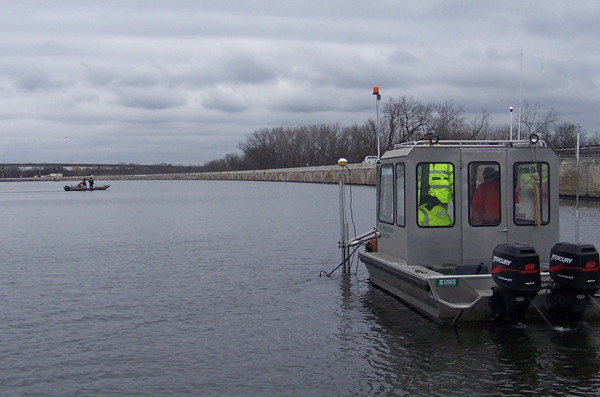 To help the DNR track the rotenone, the USGS laced the poison plume with a tracer dye and monitored its progress downstream with bankside and boat-mounted fluorometers. That let crews at stations along the canal know when the Rotenone had arrived and that it was time apply a chemical — potassium permanganate — that neutralizes the poison. The DNR maintained a steady injection of Rotenone through a pipe installed just upstream of the barrier. 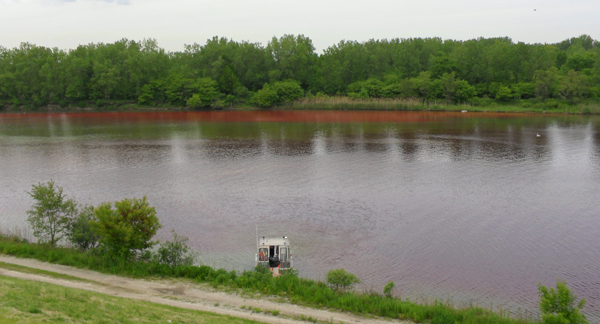 Just downstream of that site, the USGS began pumping Rhodamine WT dye into the canal 10 minutes before the poison application began and continued until 10 minutes after the Rotenone stopped flowing. With the plume encased in dye, real-time data from fluorometers could signal treated water. The fluorometer setup included six instruments installed at fixed locations approximately every mile along the treatment reach. Two boats also carried sensors, one roaming the canal and continuously mapping the plume, while the other leapfrogged ahead of the plume and waited for it’s arrival and strategic locations. Those included additional Rotenone injection sites along the canal to boost concentrations as the plume progressed and became diluted. The plume took more than 30 hours to move through the treatment reach. Jackson was on the water the whole time. Part of that job was navigate among boats from multiple agencies equipped with nets to clean up the inevitable results of an effective Rotenone application. The agency recently released a report describing their methods and results of the 2009 application, as well as a similar effort in 2010 on the Little Calumet River.